The U.S. Shark Conservation Act of 2009, a bill that offered a critical lifeline for sharks, has recently been blocked by a dysfunctional U.S. Senate. Sharks are being decimated primarily to supply shark fin soup as an expensive status symbol delicacy to the burgeoning middle class of Asia, mainly in China. If not rapidly passed, the Act will have no purpose once sharks hit their impending point of no return. Resurrecting this legislation is urgently needed for both the preservation of sharks and our nation's fading conservation ethos. The threat to sharks from finning and to a planet that requires their continued existence isn't half-baked ideology -- it's empirical fact. 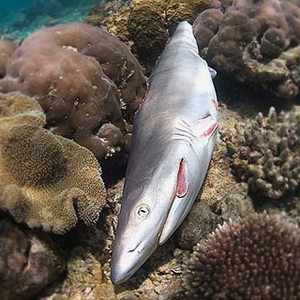 Studies are consistently revealing that sharks, as apex predators, are essential to regulate species abundance and distribution to maintain healthy oceans. Yet the world's sharks are being slaughtered at an unsustainable rate of 3 per second (estimated at 100 million annually). After capture, shark finners hack off the fins (worth up to $300 a pound) and the less valuable mutilated shark is tossed back to sink and slowly die. This travesty was acted on by our lawmakers a decade ago with the U.S. Shark Finning Prohibition Act of 2000, a legislative milestone that made it illegal to have fins aboard any vessel in U.S. waters without the corresponding shark carcasses. In 2002, the U.S. Coast Guard confiscated 32 tons of shark fins from the King Diamond II, a U.S.-flagged cargo ship that was buying fins at sea for transshipment to China through Guatemala. The massive load represented the killing of at least 30,000 sharks along with discarding 1.3 million pounds of edible flesh. 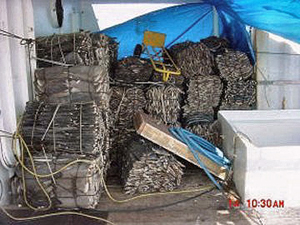 The seizure was contested in the 9th District Court of Appeals in 2008, and won with an interpretation that "cargo" vessels were free to work in tandem with "fishing" vessels -- transferring shark fins at sea to then become a legal commodity. 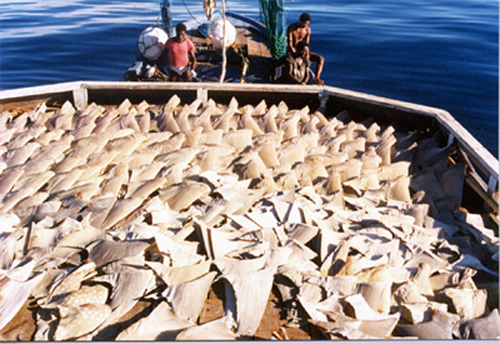 This awful ruling created a loophole that essentially nullified the U.S. ban on shark finning. Secured in cold storage as evidence, the 32 tons of fins were returned to the vessel's owners to be sold in China. Shortly after, Congresswoman Madeleine Bordallo (D- Guam) championed corrective legislation which passed in the House of Representatives as the Shark Conservation Act of 2008. The Act required that sharks be landed with their fins attached regardless of how the ship was designated, and urged all international organizations to adopt similar conservation measures. The renamed Shark Conservation Act of 2009 (S.850) proceeded into the Senate, where it then languished in the Senate Committee on Commerce, Science, and Transportation before finally failing passage in the 111th Congress on September 29, 2010. Although the Act had "unanimous consent," it was blocked by an objection from Senator Tom Coburn (R- Okla.), often referred to as "Dr. No" for his frequent abuse of the Senate's "hold" privilege where legislation is hijacked with the threat of filibuster. The problems that are facing this country are so massive that our attention ought to be focused on those large problems. Not on five separate bills that have been proffered for special interest groups... We're going to run a $1.4 trillion deficit and we have unanimous consent requests to move to things that spend more money. Money that we don't have that we're going to borrow from the Chinese or the Russians to be able to pay for it and we're going to spend the money overseas. To decipher this fear-mongering propaganda: under the guise of fiscal conservatism, Senator Coburn postured over controlling government spending while he flagrantly dismissed the Shark Conservation Act without due consideration. He not only displayed his ignorance of an environmental crisis, he obviously didn't even read the bill. Coburn's vague assertions were painfully ironic: as far as benefiting any real "special interest groups" the senator's game-playing in blocking the Act directly benefits the shark finning cartels and China's market for shark fins while greatly damaging U.S. ecosystems and economies. The cost for the Shark Conservation Act was set at a paltry $1 million a year, but there's actually no new cost as the Act simply restores the intended enforcement of an existing U.S. law. The fact that the Interior Dept. sponsored a number of proposals for shark protection in this year's Convention on the International Trade in Endangered Species dispels Coburn's ruse of undefined "special interests." In truth, the Shark Conservation Act directly benefits the U.S., and the slaughter of sharks has already damaged our economy. The depletion of large sharks in the northwest Atlantic has caused an explosive increase in their prey species such as cownose rays. The unchecked rays, in turn, grew tenfold in number and overwhelmed their prey of shellfish. This decimated the Chesapeake Bay oysters and caused the total collapse of the century-old bay scallop fishery in North Carolina in 2004. Additionally, without the water-filtering function of shellfish consuming plankton, toxic "red tides" that harm marine life and people increased in frequency and size. The plunder of sharks has now cost the U.S. hundreds of millions of dollars in income lost to fishermen, to businesses dependent on their catch, to entire coastal economies ruined by red tides, and in lost tax revenue. It would appear that a rogue ideologue, Senator Coburn, can sweep away a decade of U.S. conservation effort towards stopping environmental and economic havoc. But, in fact, he could never get away with this abuse of the "hold" option without the backing of an entire pack of fellow obstructionists that take turns using this ploy. In addition, blame must also go to the indifference of Senator Jay Rockefeller (D-WV), who allowed nearly a year and a half to pass without moving the Shark Conservation Act out of the committee he chaired. This inaction made the Act more vulnerable to Senator Coburn's obstructionist guillotine when it was finally shoved into the 111th Congress along with a huge backlog of rushed legislation. Political manipulation that facilitates ecological and economic ruin is surely antithetical to our right to "Life, Liberty, and the Pursuit of Happiness." The Senate's acceptance of being powerless on the blocking of vital legislation such as the Shark Conservation Act due to some "tradition" is rubbish. Convoluted filibuster and "hold" rules have allowed a coup to overtake our Senate, now subverting majority rule. These "traditional" rules aren't even law -- they're just codes of conduct imposed by the Senate upon itself. At the onset of the next session of Congress, those senators that have a spark of courage and integrity must resolve to jettison these rules and restore governance to a functional Congress. The U.S. Shark Conservation Act of 2009 is urgently needed, but corruption, ignorance, and political maneuvering has now precluded wise action by our Senate. People don't have to remain idle while the Senate stagnates. Individuals can exercise their right to become informed and take considered action in ecological stewardship. Citizens should write or fax their senators and demand they reintroduce and pass the Shark Conservation Act of 2009 (S. 850) at the next session of Congress along with rejecting the arcane filibuster and "hold" procedures that are strangling it. We mustn't bow to any destructive tradition, be it for soup or senators.